Chinese culture certainly has no shortage of symbols of luck and good fortune, many of them stemming from wordplay or riddles. These symbols are easily seen in everyday life, but sometimes their meaning is not easily discernible. Just take a look at the color red as an example. It doesn’t take the most observant person to realize that red holds an auspicious sentiment here; being especially prominent during Spring Festival. 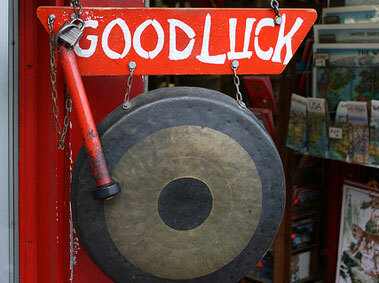 In this article, we’ll take a look at eight lucky symbols often seen or heard about in China. Of course this list is in no way all-inclusive, but you can help expand on it in the comments section below. You’ve likely heard about the number craze in China and the lengths people go to in order to have these auspicious digits displayed in their phone numbers, on their license plates, or in any other way possible. China’s number language stems from other words in the Chinese language with the same or similar pronunciation but taking on a different meaning. The luckiest numbers are six (good for business), eight (representing wealth and prosperity), and nine (meaning long-lasting), and the unluckiest is the number four (similar to the word ‘death’). Of course there’s also a wealth of number combinations with even more special meanings. I once heard about a Chinese person insisting on leaving an extra 5 RMB to avoid a 250 RMB bill at a restaurant, because 250 means ‘foolish’ or ‘idiotic’. This number business is serious! If you’ve ever wondered about the roots of the cabbage statues that can be seen in many restaurants, homes, or places of business, your answer is here. The Chinese name for the napa cabbage is homophonous with the words ‘hundred’ and ‘wealth’ and it is thus viewed as a sign of prosperity in China. Believed to bring hundreds of years of wealth, the cabbage is often used as a symbol in glass and porcelain figures. The most famous of non-edible cabbages is a small jadeite sculpture that is part of the collection at the National Palace Museum in Taiwan. This particular piece is said to represent female virtue with its varying shades of white and green symbolizing purity and fertility, with a locust and katydid camouflaged in the leaves to represent children. This figurine actually takes root in Japan, but has become increasingly popular with Chinese merchants. The Japanese name, maneki-neko, means ‘beckoning cat’ (and all along I thought it was waving, not beckoning). It is made of ceramic and is believed to bring good luck to a shop owner, oftentimes displayed at the entrance of a shop, restaurant, or other business. The cat’s typical colors are white, black, gold, and sometimes red, and it is often holding a coin, bringing good fortune and wealth. In modern Japanese culture, keeping a lucky cat in a bedroom or place of study is said to bring about favorable results and life successes. The Malabar chestnut tree plays an important role in East Asian culture and it has now become known as the ‘money tree’. Its popularity came about in 1986 when a Taiwanese truck driver braided the trunks of five small money trees planted in a single pot. The money tree is thought to bring good fortune and luck to those who place it in their home or office. As the tree grows, distinctive five-leaf stems sprout from it and the abundance in leaves is often reflective of the owner's financial fortune. It is a relatively low-maintenance indoor plant and some sources say that the leaves are edible, as are its flowers and nuts. Chinese knotting is a type of folk art that dates back to the Tang Dynasty. Chinese knots consist of a cord, a knot, and a tassel, and are characteristically made using a single piece of thread. Finished knots look identical from the front and back, although they can take on many different shapes. The most commonly used color in Chinese knotting is red, symbolizing good luck and prosperity, and it can also be used to ward off evil spirits or to bring good luck to a marriage. A trip to the supermarket around the Chinese New Year will reveal Chinese knots ranging from small to large, typically all used as home décor or for gifting. The celestial Buddha named Pu-Tai is traditionally depicted as an obese, bald man wearing a robe and carrying prayer beads. His large stomach and jolly smile have given rise to his name, Laughing Buddha. In Chinese culture, the Laughing Buddha is considered a man of good and loving character and his image represents contentment, happiness, good luck, and abundance. This Buddha can be seen in many temples, restaurants, and businesses. I’ve also seen him adorning some Chinese homes. His name in Chinese means ‘cloth sack’ because this is exactly what he uses to carry his few possessions and some precious items that he gives to the weak, the poor, and to children. He is particularly fond of children and is usually depicted entertaining or being surrounded by groups of them. Bamboo is an important element of Chinese culture, not only as a plant but also as a part of people’s lives. People plant bamboos, eat their shoots, paint bamboos, write poems about them, and speak highly of gentlemen who are like bamboos. As it turns out, bamboo has long been the Chinese symbol for strength. Many admire the bamboo’s qualities of fast-growth and resilience. The symbol of bamboo is used to express an understanding of what a real gentleman should be like: according to ancient poetry, a man must be mentally strong, upright, and perseverant, even if he is not physically strong. Just as a bamboo is hollow-hearted, he should open his heart to accept anything of benefit and never have arrogance or prejudice. A quite interesting connection one might otherwise never know. Fish in China are considered a symbol of luck in several ways. Since the Chinese pronunciation of fish is the same as that of another word meaning surplus, fish are often used as a sign of wealth or abundance. During the Spring Festival, a fish is prepared but left uneaten to represent the desire to always have something left over for the coming year. One can also often see carp or koi depicted in Asian artwork. This fish is able to grow very old, therefore serving as a symbol of longevity. It also represents unity and fidelity since they often swim together in pairs. This explains why fish charms are often given as a wedding gift to represent a perfect union. Finally, fish are also a symbol of fertility because of their ability to reproduce rapidly and in large volumes. So much luck, so little time! 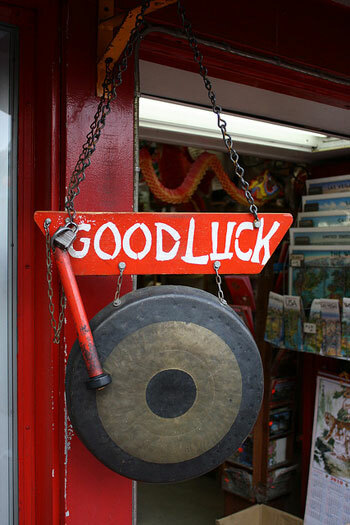 What other good luck symbols have you learned about in China? None of these things are as lucky as having a relative working as a government official.